With the holidays almost here, it’s time to deck those halls! As travel nurses everywhere know, decorating in a temporary home can sometimes mean wishing for a Christmas miracle. Never fear! With these 5 holiday decorating tips for the travel nurse, you’ll be able to make your home feel merry and bright without the help of Santa’s elves. You can make a big statement in a small space with these holiday decor ideas! 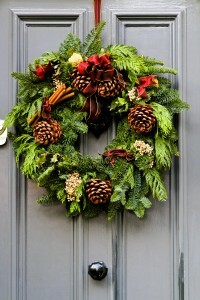 Purchase an evergreen wreath: Don’t have the space for a tree? No problem! Use a real pine wreath for instant holiday style. They’ll make your apartment smell like a Christmas tree without the mess. What’s not to love about that?? Add sparkle with twinkle lights: Create a winter wonderland in just minutes. White or colored lights hung from your ceiling or draped gracefully over doorways can add a touch of glamour to tiny spaces. Hang ornaments from bookshelves: Who needs a tree to decorate when you have a bookshelf? Dress up your ordinary furniture with ribbons and glittering glass balls for full effect. Those wall hooks we mentioned earlier might come in handy here. Extra tip: you can hide the hooks if you stick them on the top of your furniture. Add a holiday throw pillow: If DYI really isn’t your thing, you can simply spruce up for your living room couch with fun, holiday throw pillows. No fuss, no muss. We told you it was easy! Need a few ideas? Click here! Thanks to these 5 holiday decorating tips for the travel nurse, you’ll be ready for the season in no time! Any decorating tips that we missed? Let us know how you adorn your apartment for the holidays in the comments below!